How do small things make you feel? Do you sense their vulnerability and seek to protect them? Or does their smallness seem irritating and invasive, as they tug you out of your comfort zone? Regardless of where we find ourselves, there will always be those among us who will be more vulnerable than others. 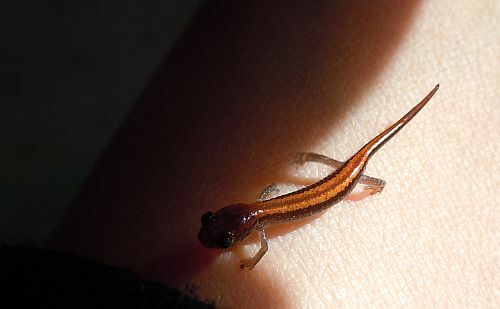 They may be very small in size like this baby red-backed salamander, or, although a bit bigger, they may suddenly find themselves in situations they aren’t prepared to handle on their own. Sometimes they manage fine without our intervention. Sometimes they don’t. Awareness is key. If we don’t know of the small and vulnerable in our environment, how can we be expected to act on their behalf? Or, at the very least, do them no harm? It’s through the small things that we develop our moral imagination, so that we can understand the suffering of others. 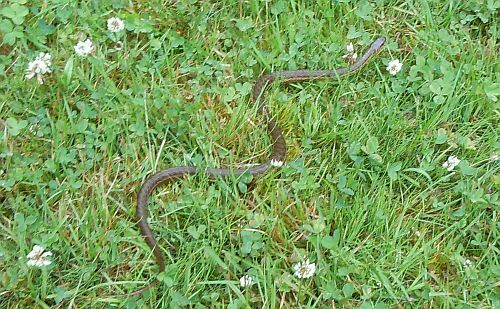 Often described as ‘cool’ and ‘cute,’ snakes were a precious discovery in the yard when my sons were young. My grandsons were just as smitten recently when their dad was able to capture one I had spotted swimming across a large vernal pool in the woods. This Maritime Garter Snake Thamnophis sirtalis pallidula was in its Unstriped phase. 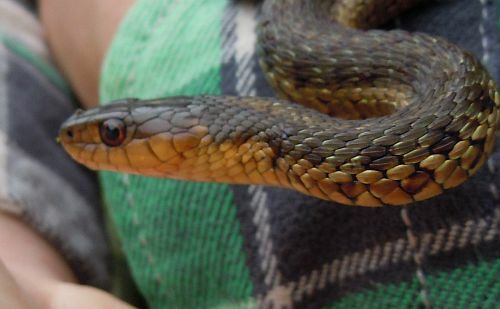 These garter snakes also have Black and Striped phases. 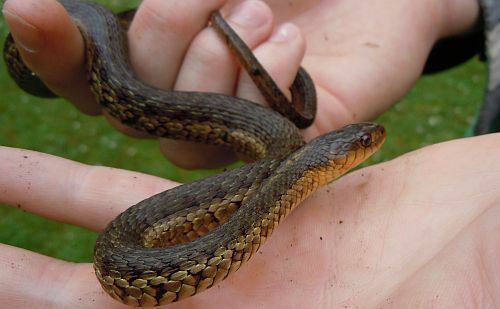 It seemed fairly non-aggressive according to my son, who’s been bitten by garter snakes in the past. It was pretty compliant and even stuck out its forked tongue for the camera. As I expected, there were tears shed when it was released back into the wild. Why can’t we keep it? I want to keep it as a pet! Though they can be fairly friendly, garter snakes do give off a bad scent in captivity or when they feel threatened. When will we ever find another? I’ve come across a few already in the woods this year, so there’s a good chance we’ll see another soon. Mating-crazed junco obsessed with its reflection in my car’s mirror. Check. 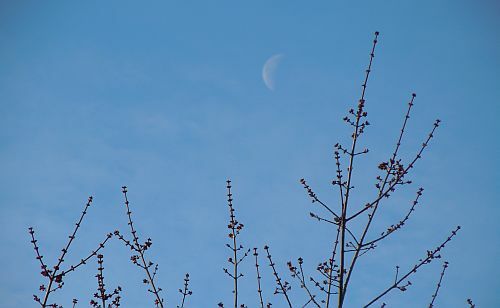 Chickadee and mourning dove calling from the treetops. Check. Check. Creepy crawlies under the garden stones: Millipede, earthworm, beetle, salamander. Check. Check. Check. Check. 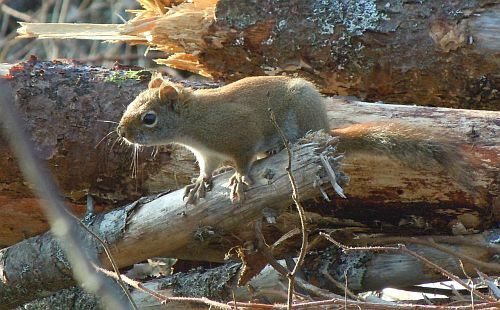 Red squirrel defending its territory. Check. 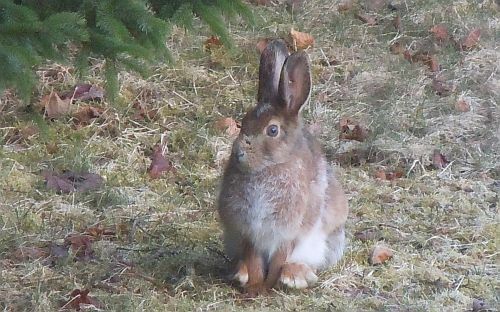 Snowshoe hare on the lawn. Check. 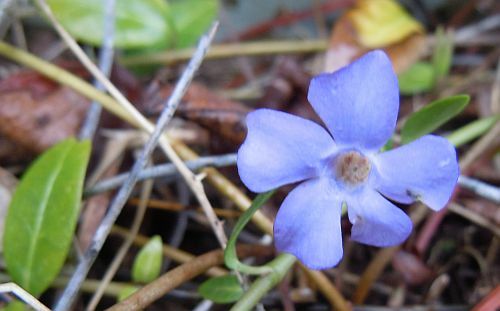 The first periwinkle of the season. Check. 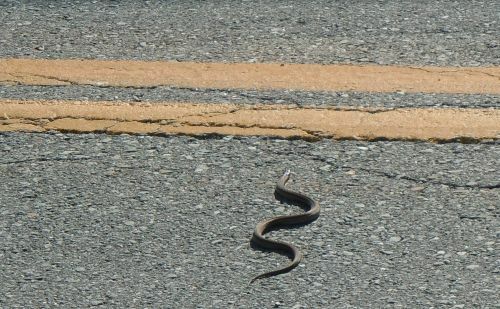 Why did the snake cross the road? Didn’t it feel the vibrations from oncoming traffic? Hey, do I look worried? This maritime garter snake managed to survive being run over by a truck, luckily slipping between the tires. Why was it willing to risk life and limb to get to the other side? Was it looking for something tasty to eat? Snake berries perhaps? For years I’ve heard both adults and children talk of ‘snake berries.’ Could these be berries that were frequently eaten by snakes? 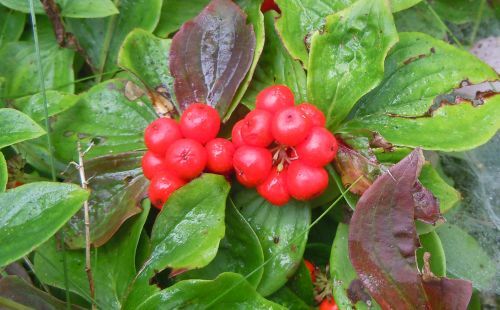 As children, my sons and their friends used the term to describe the fruit of the bunchberry plant, shown above. It seemed that only the daring among them had ever tried tasting these snake berries. My friend Sandy thought snake berries were blue. Others who knew of snake berries weren’t able to describe the plant in any detail. After a bit of digging, I discovered that the term is used to describe any berry of questionable edibility. 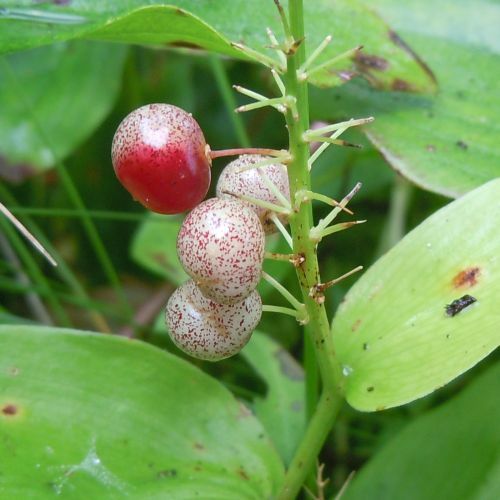 So, if you are in the woods, and see a berry that you’re not sure you can eat, you might choose to call it a snake berry. All snake berries are therefore considered poisonous. By the way, bunchberries are edible. They’re bland with a large pit, but edible nonetheless. Since the berries shown above are unknown to me and I’m not sure if they’re safe to eat, I’ll call them snake berries until I can learn more about them. And since all snakes are carnivores, there’s no way that they would eat this or any other berry. So, as to why the snake crossed the road… in Cow Bay, there can only be one answer: it was the pheasants’ day off! Hey, what are you doing awake? Aren’t you supposed to be hibernating? 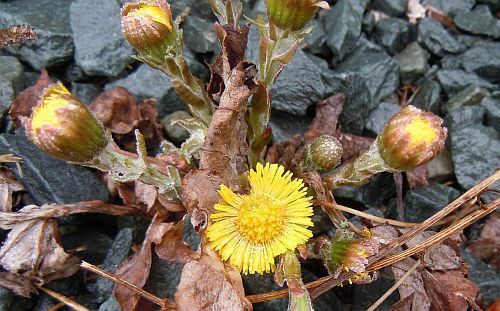 It was so warm that I decided to come out and see if it was spring yet. Weren’t you just out last month during a warm spell? Yes, but this mating business is so important to us salamanders that I can’t let spring pass me by. I have to check out every possibility. Where do you usually spend your winters? 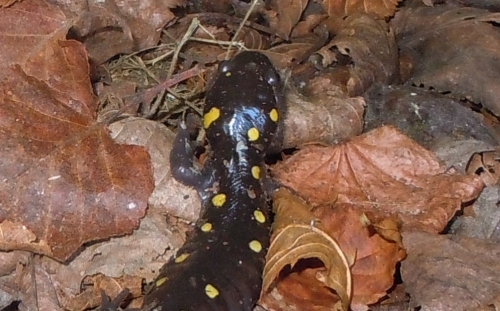 We yellow-spotted salamanders ideally hibernate about six inches underground. However, I’ve just been buried beneath some leaves that are heaped on a concrete floor. Maybe that’s why I keep waking up. I need to find some deeper digs. Once you really know for sure that it’s spring, where will you go? 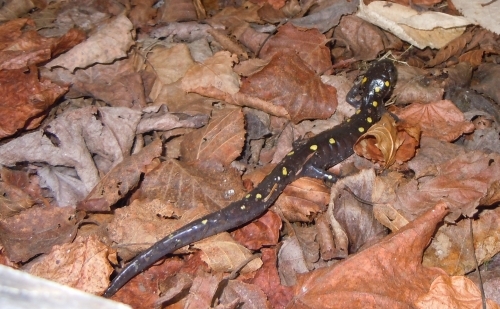 In very early spring, we salamanders return to pools of water to mate. 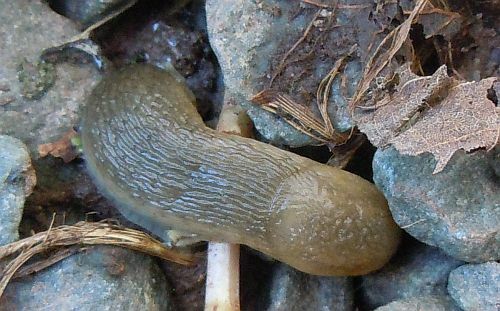 Females will lay up to a couple hundred eggs. 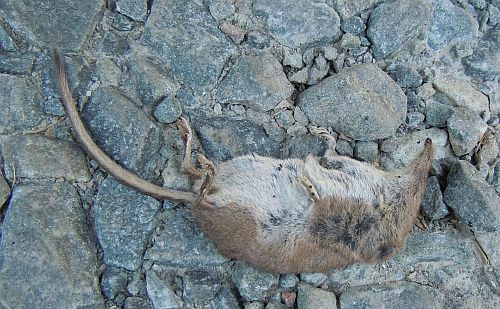 Temporary vernal pools created by melting snow and spring rains are our favorite places because they aren’t home to the predators found in more established watering holes. We have to get there quickly so that the eggs have a chance to go through all the phases of growth before the pools dry up. Waking up throughout the winter takes up a lot of the precious energy I need for mating in the spring. I’m going to find myself a spot where I won’t be disturbed. See ya! 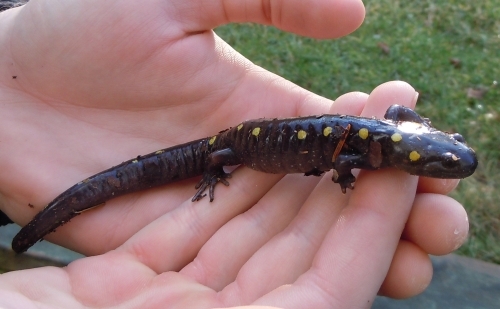 This yellow-spotted salamander was found wandering about on January 1st. It was previously seen on December 6th. 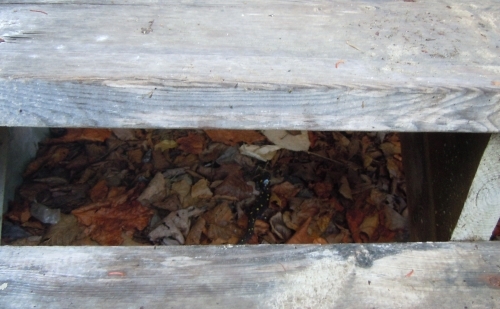 Do you ever wonder about what lies lurking beneath the stairs? Outdoor open-riser stairs that lead below ground level easily spark the imagination with images of creepy creatures that lie in wait beneath the dead leaves. I’ve often found toads and frogs in such a spot, but yesterday’s discovery was the most remarkable yet. 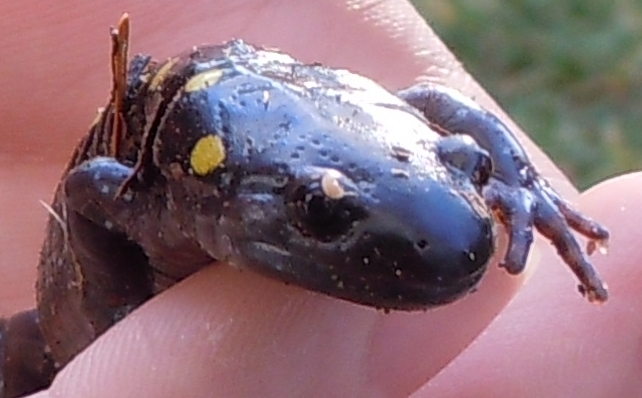 A beautiful yellow-spotted salamander (Ambystoma maculatum) scrambled out of the leaves to enjoy the milder December weather. It was more marvelous than creepy, a veritable wonder to behold. 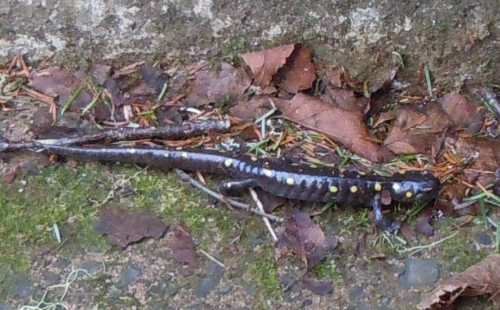 Although they are not uncommon in Nova Scotia, I’ve only seen a yellow-spotted salamander once before near the compost pile. 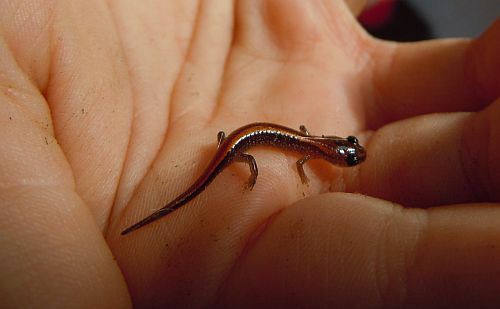 Red-backed salamanders are a much more frequent find in my yard. At least half a foot in length, this salamander possesses the amazing ability to drop its tail in order to distract predators. Even more wonderful is its ability to regenerate its tail, limbs and even parts of organs if necessary. 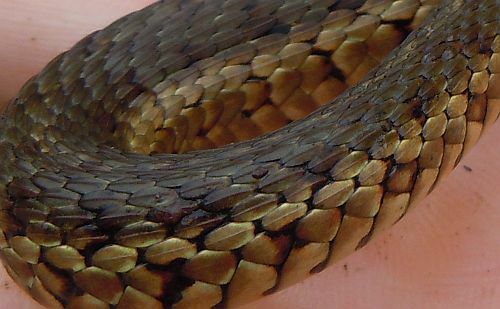 If it feels threatened, it can also release a whitish poison from glands around its back neck. This one simply held still until the photo shoot was over. Then it scrambled back into the leaf litter. 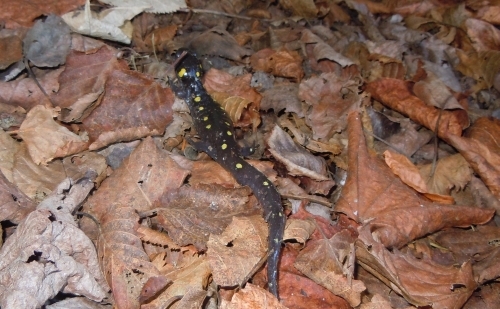 If it survives the winter, in early spring, this salamander will make its way at that time to the nearest pond to reproduce. In the meantime, it’s welcome to make its home beneath the stairs.